Mai dang lao (麦当劳）is the Chinese name for McDonald's and they deliver! The delivery guys use motorized bikes and temperature controlled backpacks to keep your burgers and fries warm. I snapped this picture the other day and thought I’d share. Every country seems to have their own twist on the McDonald’s experience. I’ve had spaghetti and a McDo at McDonald’s in the Philippines, ordered a guanarana at McDonald’s in Brazil, and I can remember when chicken nuggets arrived at McDonalds in Beijing in the early 90’s. In Thailand, Ronald McDonald always greets me with a wai. 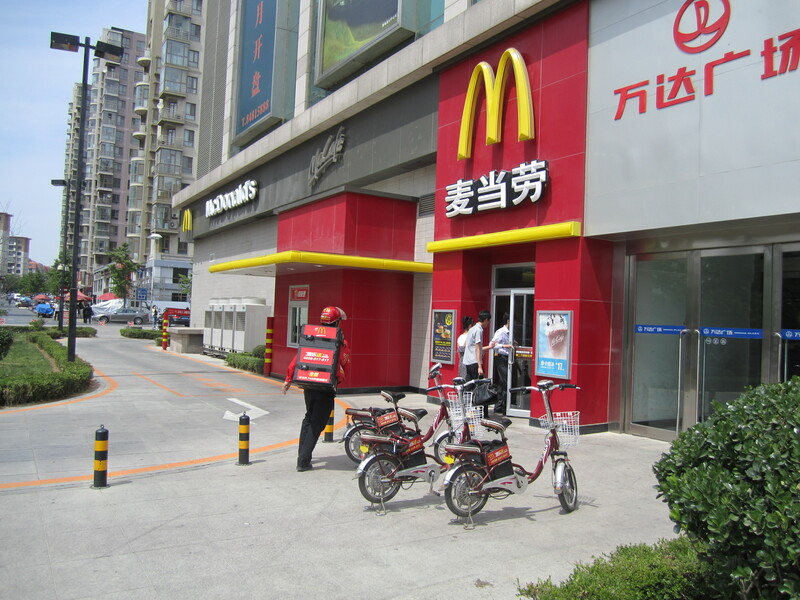 McDonald’s in China has a very different “feel” than in the US. Several of my students recently pulled an all-nighter at a McDonald’s to study for an exam. It is one of the few spaces available to them that’s open 24-hours a day. After 10:45, the electricity is cut off in their dormitories, which doesn’t exactly lend itself to late-night studying. Going to McDonald’s for a meal is seen as something special, not tacky or trashy like in the States. 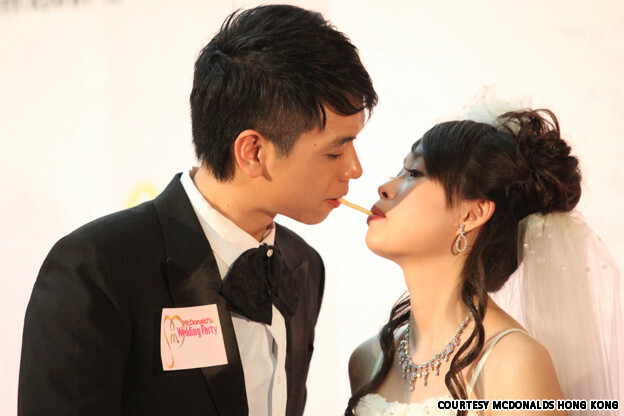 It’s also a popular date spot and when I was teaching a unit on relationships, I found an article about how McDonald’s in Hong Kong are now offering all-inclusive wedding packages. According to a New York Times article, the McWeddings start at $1,280 including lots of McDonald’s goodies for your wedding guests. I showed the article to my students and asked them what they thought. Most people said that they wanted a more traditional wedding, but several students in each class thought that it could be fun. One student talked about how she had special memories of the first time she went to McDonald’s as a kid, so it would be a unique and meaningful place to get married (and a lot less stressful than planning a traditional wedding). My posts might be sporadic for the next few weeks as I finish up the semester. Soon I’ll post some pictures from my recent three-day trip with a Chinese tour group. It was quite an experience to say the least! Well Kimberly not too many people can have the honor of eating at so many McDonalds in other countries. Hopefully somewhere you have all these experiences in writing and someday will do a book on your life. Can’t wait until Aug and we can actually sit down and talk. Enjoy your time in China.